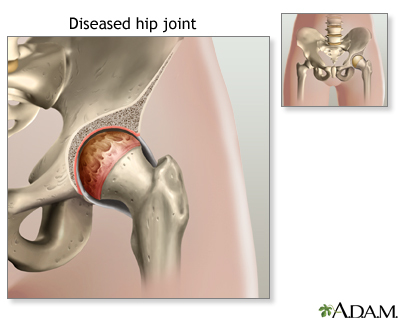 Osteoarthritis is the most common disease of the hip. It is caused by wear and tear on the joint. Cartilage is the firm, rubbery tissue that cushions your bones and joints. It allows bones to glide over one another. Cartilage can break down and wear away. As a result, the bones rub together, causing pain, swelling, and stiffness. The most common reason to have a hip joint replaced is relieve severe arthritis pain that limits what you can do. 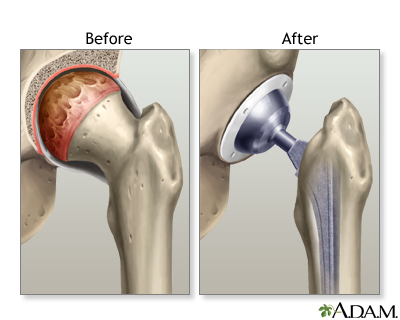 Hip joint replacement is usually done in people age 60 and older. This is because most artificial hips do not last more than 20 years. Also, younger people who have this surgery tend to place more strain on their new hip. A socket that replaces your old hip socket. The socket is usually made of metal. A liner that fits inside the socket. It is usually plastic, but some surgeons use ceramic and metal. The liner allows the hip to move smoothly. 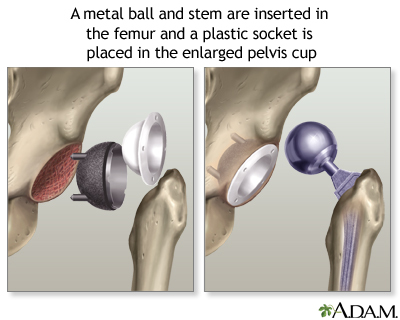 A metal or ceramic ball that will replace the round head (top) of your thighbone. A metal stem that is attached to the shaft of the bone. Remove the head of your thigh (femur) bone. Clean out your hip socket and remove the remaining cartilage and damaged or arthritic bone. A small drainage tube will be placed during surgery to help drain excess fluids from the joint area. A large dressing will cover to the hip area. This surgery usually takes 1 to 3 hours. You will stay in the hospital for 3 to 5 days. Full recovery will take from 2 months to a year. Hip replacement surgery results are usually excellent. Most or all of the hip pain and stiffness should go away. Some people may have problems with infection, or even dislocation, of the new hip joint. 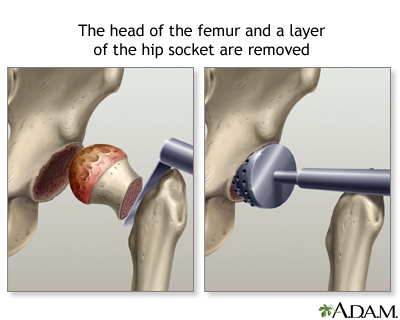 Over time -- sometimes as long as 20 years -- the artificial hip joint will loosen. A second replacement may be needed. Younger, more active, people may wear out parts of their new hip. Their artificial hip may need to be replaced before it loosens. It is important to have scheduled follow-up visits with your surgeon every year to check the position of the implants. By the time you go home, you should be able to walk with a walker or crutches without needing much help. Use your crutches or walker for as long as you need them. Most people do not need them after 2 to 4 weeks. Keep moving and walking once you get home. 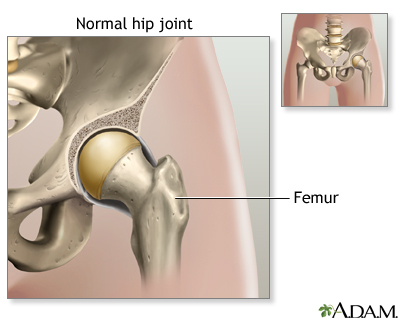 Do not put weight on your side with the new hip until your doctor tells you it is okay. Start out with short periods of activity, and then gradually increase them. Your doctor or physical therapist will give you exercises to do at home.